Taking a lifespan approach, this book gathers the top scholars in social work practice to create a resource that presents practice skills and interventions for working with individuals, children, and families. The evidence-informed process in each chapter critically appraises the research and evaluation of each intervention, including limitations in the evidence base for a given intervention. Looking closely at vulnerable populations and other groups in need, this book offers students and practitioners clear guidance for working with children, adolescents, adults, the elderly, and families. 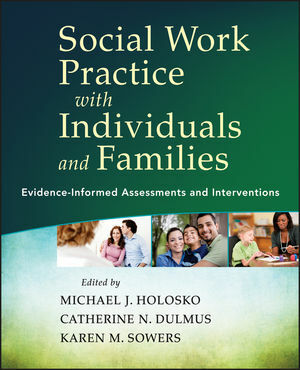 MICHAEL J. HOLOSKO, PhD, MSW, is the Pauline M. Berger Professor of Family and Child Welfare at the University of Georgia, School of Social Work. He has taught across the undergraduate and graduate curriculum in schools of social work, nursing, public administration, and applied social science in Canada, the United States, Hong Kong, Sweden, Australia, and the U.S. Virgin Islands. CATHERINE N. DULMUS, PhD, LCSW, is Professor, Associate Dean for Research, and Director of the Buffalo Center for Social Research in the School of Social Work at the University at Buffalo, SUNY, and Research Director at Hillside Family of Agencies in Rochester, New York. KAREN M. SOWERS, PhD, is Dean and Beaman Professor in the College of Social Work at the University of Tennessee, Knoxville. Her research interests include juvenile justice, sexuality, social work education, child welfare, evidencebased practice, and international social work practice.